Easy Tuna Casserole is a deliciously simple and creamy casserole that everyone loves! 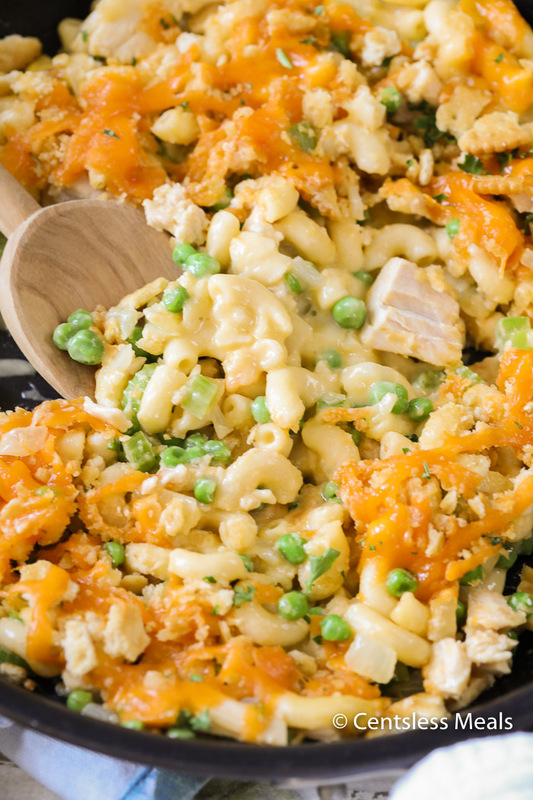 Tender cheesy macaroni noodles, peas, celery, onion and tuna in are topped with a buttery cheesy topping and baked until golden and bubbly! 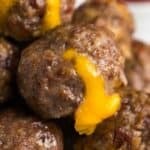 This is an effortless weeknight meal in just 30 minutes! 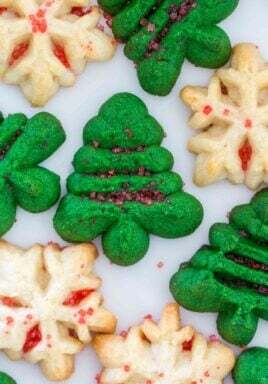 Thank you to Bob Evans Foods for sponsoring this delicious recipe! On those nights that you just need a quick and easy meal, this tuna casserole has got you covered. 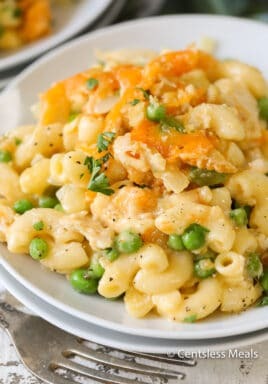 Tender flakes of tuna are mixed with , peas, onion, celery, and creamy Bob Evans Macaroni and Cheese. We top this casserole with a mixture of crushed crackers, cheese, and melted butter and bake it until it is golden, bubbly, and ready to serve! If you’re like me, by the time it comes to throwing dinner together I always seem to be running behind. From soccer practice to homework help, house cleaning, and work, dinner usually ends up being last minute! 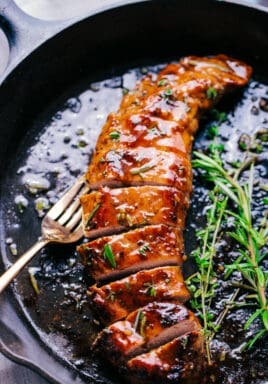 More often than not, when 5 o’clock rolls around, I catch the time and realize dinner needs to be on the table stat (I know I am not the only one who’s done this… right?)! For days like this, I always pull out my classic dinner saver – a quick tuna casserole. 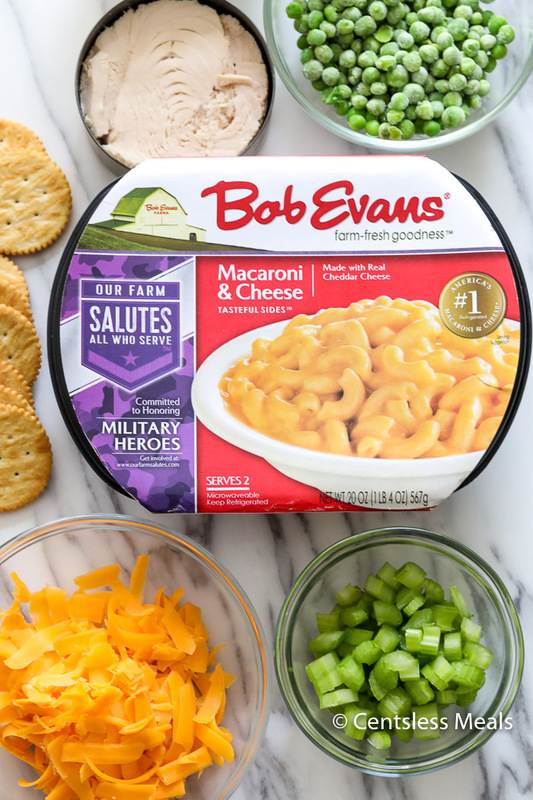 My favorite shortcut is using Bob Evans Macaroni and Cheese! It makes this tuna casserole a total breeze with no boiling noodles and a delicious creamy sauce ready to go (and no cream of mushroom soup for my picky mushroom kids)! It’s some of the creamiest, easiest, and cheesiest mac and cheese I have tried (and trust me, mac and cheese is my jam). Of course it makes a perfect side dish but I love using it as a base to create a totally effortless main dish too! In literally minutes, you can create this easy tuna casserole that the whole family will love (I know because it is usually gone by the end of dinner)! The tender tuna flakes paired with the crisp and crumbly topping and the cheesiness of the mac and cheese really makes for an unforgettable 30 minute meal! Tuna casserole (or any casserole for that matter) doesn’t take too much effort to put together, which is why they are such a perfect weeknight dinner option. In an oven proof pan, cook celery & onion until tender. Stir in peas, tuna and macaroni and cheese and stir gently. Add your topping, bake and voila! Tip: If your pan handle isn’t oven proof, cover it in foil. This casserole doesn’t cook long and it will be just fine in the oven. Technically this casserole will freeze just fine. 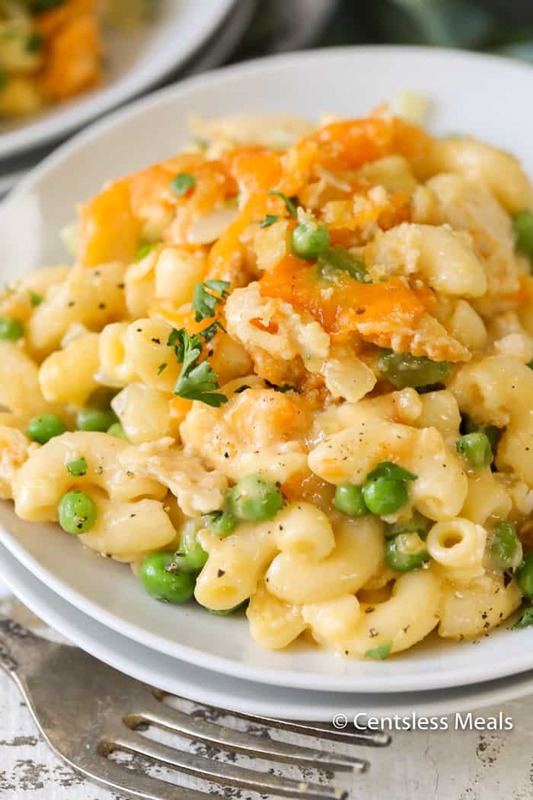 Tuna casserole will last a few days in the fridge and this recipe makes just 4 servings so I would suggest reheating it fresh instead of freezing (it makes a great lunch as well). I add a spoonful of milk when reheating to keep it nice and creamy! On those nights that you just need a quick and easy meal, tuna casserole has got you covered. 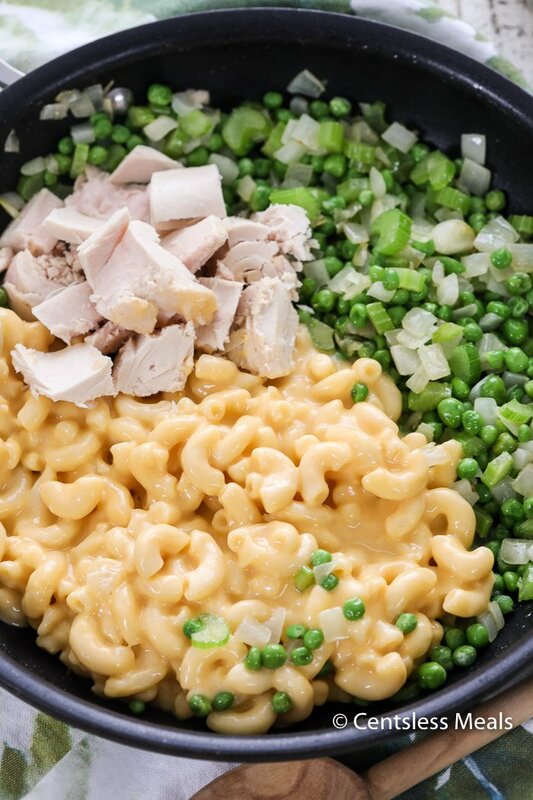 Tender flakes of tuna are mixed with creamy mac and cheese, peas, onion, and celery. We top this casserole with a mixture of crushed crackers, cheese, and melted butter and bake it until it is hot and ready to serve! Combine Cheese, crackers and melted butter. Set aside. In an ovenproof pan, cook onion and celery in butter until tender. Stir in peas and cook 2-3 minutes. Gently stir in macaroni and tuna. Top with crumb topping and bake 15 minutes or until heated through.